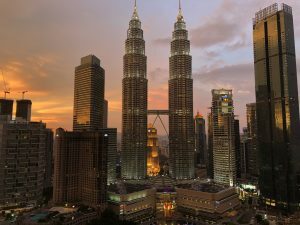 LearnKey Blog » Just a little unsure in Kuala Lumpur. Just a little unsure in Kuala Lumpur. Month one has come to a smooth coast. Feels like the longest month of my life (in the best way possible). Wow! What a diverse population to say the least. Muslim, Hindu, Arabic, Indian, Indonesian, and Chinese influences make up the welcoming city of Kuala Lumpur, also known as KL. 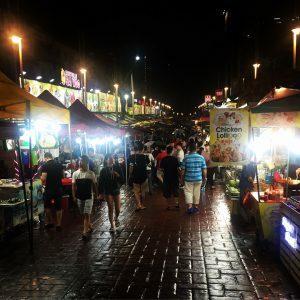 KL is littered with hidden labyrinths of indoor malls, amazing diverse food stalls, and pop-up restaurants. If you needed anything at all, you would find it in a mall. Need a dentist? In the mall. Need vaccinations? In the mall. Need an Auntie Ann’s pretzel fix? In the mall. Grocery stores? You guessed it, the mall. The bustling metropolis is home to innumerable skyscrapers reminiscent of downtown Manhattan mixed with the luxurious shops of the Las Vegas Strip. The two most iconic buildings are the Petronas Twin Towers and the Kuala Lumpur Tower (pictured). Petronas has also become home to the most employees in KL, home to over 50,000 employees. Through interactions with the local people, I have learned that Maybank, Shell (oil and gas companies are abundant in the market), and Intel are large and sought-after employment options. If there wasn’t a mall or skyscraper taking up real estate it was a temple. The temples (Hindu and Muslim mostly) in KL were stunning to say the least. The detail, dedication and decadence of the religious people is much to be admired. One of the first experiences I had was the religion procession, Thaipusam (pictured). Beautiful chaos, as we entered the Divine Circle. 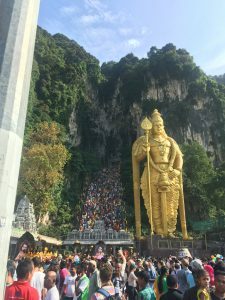 Religious devote faithful climbed almost 300 stairs with hooks in their flesh, bare feet, and 5 feet tall to the temples nestled inside a natural cave. As we, the remote year family, ascended the stairs, the amount of people exponentially grew as quickly as personal space diminished. At the entrance of the Batu Caves, we were greeted by devote Hindu’s eating hot coals to remove them from trance state, smells of warm bodies, incense, fragrant saffron, and turmeric permeate the air, American sports-like announcers chanting Malaysian blessings and the beat of the drums kept us going up what seemed to be a never-ending stair climb in 90% humidity. In the temple was not short of gift shops as they lined the inside of the cave, monkeys savoring bananas and other treats people were sharing, and chickens cooing and clucking in what seemed to be their form of praise. My heart and my senses were filled and the energy and passion fueled my journey for the entire month in Malaysia. Notable observations in KL: monkeys run around the city like squirrels, our accommodations were a 5 minute walk from the world’s smallest rainforest, Bikut Nannas. From the moment I arrived, I knew I was going to have a strong relationship with the food here. Street food street (pictured) had anything you could desire from SE Asia. The pungent smell of durian that cuts through the air like hot steamy trash; it is more a mix of hot garbage (aka rubbish), sour garlic and a hint of pear. The local favorites were nasi lemak: a fragrant rice dish served with the most tender, slow-cooked chicken falling off the bone, covered in a sweet, spicy, and salty sauce. Eaten with your hands with creates a sensual relationship with food and those you enjoy it with. Another favorite (in which I ate far too much of) was roti with dahl. Roti is a magical tortilla style bread slathered with butter and served with, well, served with really anything as it was so versatile and delish! The tandoori chicken, unlike any tandoori chicken I have ever had. The street buffet had the best tandoori, it was charred and crisp on the outside and as you bite through the crisp outer crust of char from the open flame the internal white meat, falls off the bone and melts in your mouth. When laziness struck on the late-night work shifts we would have Uber Eats deliver some Halal, an Arabic favorite among the remote year fam. Luckily, walking at least 5 miles a day to enjoy local events, food, or malls, helped build up an appetite without any weight gain. The walk from the accommodations to the workspace was an interesting one as you had to cross through the jungle known as bar street. The marketing tactic for the bars and restaurants was to shout at you profusely claiming they had the best drinks, food, Wi-Fi, air con (air conditioner), really anything to get to come inside. I walked down bar street nearly every day for one thing or another and thought every time, umm don’t they remember me? I walk here nearly every day. Finding a new normal did not include that walk so often I worked late nights from my apartment which was productive but could be a little lonely. Good thing I had amazing food to keep me company on those late nights. Working night shift was an easier transition than I could even imagine. I enjoyed having my days free for exploring and had incredible support from others that had to work the same shift. It was tough as I did not see many of those who work days and could not make full use of the workspace as it would require an Uber as I did not feel safe walking home alone. Adjusting to the culture, location, weather (mainly humidity coming from AZ where there is none), all while getting to know 34 strangers and performing the duties and functions of a full-time job. Often, we refer to time as RY time, as one mentioned is a pressure cooker. Feeling after a month of knowing our RY family, many have already become close enough to be real family. How has this only been a month? Speaking in time-space continuum, it is amazing how much you can fit into a day while working 40 hours. Sleep, optional. While I was living my best life in KL, I didn’t feel like I was doing too much, however now that I am reminiscing through the photos… I do not know how I did it all. Month one, in the books. Insert Jurassic Park and/or Indiana Jones theme song into all adventures. This sounds and looks incredible! I would have felt claustrophobic climbing those stairs with that many people! It’s strange to think of a cave having gift shops and other things in it, but I suppose they are going to make money where they can with all the visitors. It sounds like an amazing place and I love hearing all about your experiences. Looking forward to the next post!